Founded in the 1920s by Louie Dingwall-Foott the operation of the "Rossmore Flyer" route had passed to Cosy Coaches of Parkstone in 1973. Cosy Coaches continued on the Rossmore route for ten years and the service then passed to the Stanbridge and Crichel company in December 1983 (following financial difficulties at Cosy and the subsequent demise of the business). 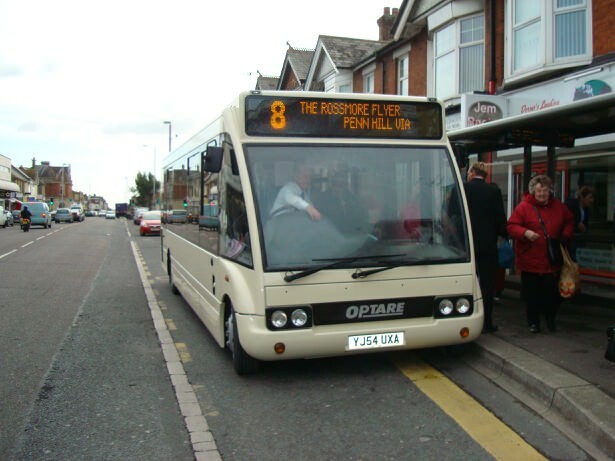 The Rossmore route still remained then the only independently operated town service in the Borough of Poole in Dorset. 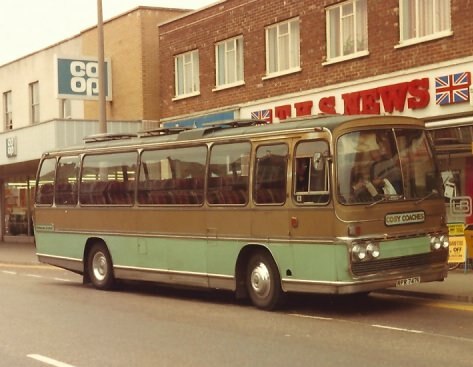 Stanbridge initially used Brian Baverstock as the regular driver in Bedford YRQ RPR747K, but then in recognition that a coach with entrance steps was not best suited to a town service, subsequently introduced KUF239F, a 1968 Bristol RE with 45 seater Marshall bus body. The regular lady driver of the Bristol was Sandy. After six years of operating the route as a one bus shuttle on a 25 minute headway - which stopped for a half hour mid-morning and for an hour at lunchtime to allow the driver to have meal breaks - the service passed to its fourth incumbent when the Stanbridge and Crichel business was acquired by Oakfield Travel of Blandford in 1989. Drivers then included Steve, 'Yorkie' and Gordon Osborne. In the same year Oakfield extended the Rossmore route to serve the then new Tower Park shopping and leisure centre development, half a mile past the traditional Trinidad Estate terminus. Also by deploying one extra vehicle for a short while they introduced new morning shoppers routes linking Upper Parkstone to Talbot Heath, Bloxworth Road and Alderney East residnetial areas, but these did not prove successful and were short-lived. RPR747K - Brian's bus - waiting at the terminus in Ashley Road for another departure on the Rossmore route up and down along Albert Road to Trinidad Estate. This picture is the same location as the one below of KUF239F, but viewed from across the road. A picture from 1985 and the route is being operated by the Stanbridge and Crichel company, with one bus shuttling to and fro all day, usually with regular lady driver Sandy. Here she is with her usual steed KUF239F, an ex-Southdown 1968 Bristol RE 45 seater, The terminus at Upper Parkstone has been relocated around the corner from the end of Albert Road to the layby in the main thoroughfare of Ashley Road - much more convenient for passengers transferring from buses from Poole or Bournemouth! (Picture by Henry Frier). 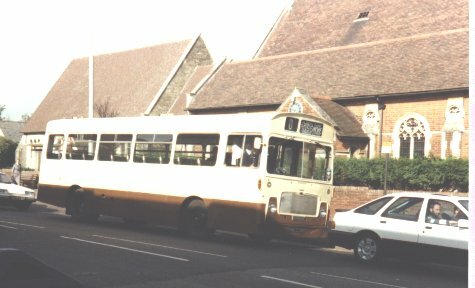 This picture shows stable mate VMO233H passing St Johns Church in Upper Parkstone after the route was further extended a few hundred yards at the `town end' to serve the then new Safeways supermarket (built on the site of the former Parkstone depot of Hants and Dorset Motor Services and the Retreat Hotel; diagonally across the crossroads from the Co-op department store where my dad spent most of his working life - now a memory itself having closed a few years ago and subsequently redeveloped as the Hogshead pub). The Retreat pub becomes the Safeways store, and the Co-op store becomes the Hogshead pub. Hmmm, there's a moral there somewhere ...... I think my dad would have approved! The 1986 timetable at the time of 'bus deregulation'. There was still a gap in the service on Wednesday afternoons, a tradition inherited from the very early days of operation on the route when the Parkstone shops took their half day. Although perhaps an anachronism by 1986 it did give the driver a useful extra few hours break in what was sometimes a long week at the wheel. The intention not to operate on 27th December proved to be an unwise one in hindsight as it turned out to be a busy shopping day! The earlier finish on Saturday allowed the driver and vehicle to operate the Stanbridge & Crichel late afternoon 17.20 hours return shoppers service from Poole to Wimborne and on through the villages to Cranborne. On the 21st August 1989, with the route now operated by Oakfield Travel of Blandford, here is a picture of the first run on the first day of the extension of service to Tower Park. SWY336L and driver 'Yorkie' wait in the morning sunshine outside Tesco at Tower Park. AEC Reliance JPA143K climbs Albert Road on the return journey. 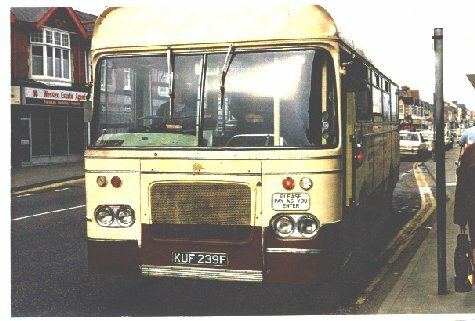 This was a much travelled vehicle, starting life with London Country in 1972 and passing to Rennies of Dunfermline in 1983. Returning to England to Johnson of Sheffield and later with Prestwood Travel of Great Missenden, coming eventually to Dorset where it was with George Pearson of Ferndown operating his Hospital Express bus service across the Poole and Bournemouth conurbation. In the 1990s it passed to Stanbridge & Crichel where it was used on the Rossmore service. The destination indicator suitably amended from Hospital Express to Rossmore Express (a misnomer if there ever was one!) as can be seen in this fine picture from Keith Newton. Oakfield then sold their business in November 1992 to Guildford and West Surrey who after a year sold the ex-Oakfield and ex-Stanbridge businesses (including the Rossmore route) to Wilts & Dorset in November 1993, who also acquired the Damory Coaches of Blandford business at the same time. Although the country routes around Wimborne and Blandford continued to be operated by Damory under their own name, the operation of the Rossmore route was thus passed over to the "old enemy" Wilts & Dorset on 1st November 1993 after 67 years of independent operation. Running one midibus as their routes 168 and 169, the extensions which had been contemplated at various times over the years to Alderney East and Bourne Estate were now covered on alternate journeys from Upper Parkstone, albeit with slightly slower running times as an extensive traffic calming project with various 'sleeping policemen' and speed humps started to be introduced in March 1993 and subsequently covered the entire length of Albert Road and half of Rossmore Road. I think perhaps the founder Louie Dingwall-Foott would turn in her grave if she knew about Wilts & Dorset - but she had passed on in 1982, nearly ninety years of age, a grand old lady who had achieved much in her lifetime. An even more surprising development came on 30th August 2005 when Wilts & Dorset relinquished routes 168 and 169 and the operation was taken over by Bournemouth Yellow Buses. The wheel turned yet again and Yellow Buses withdrew the routes on 1st April 2006 - which left us all wondering what was next for the Rossmore Bus? 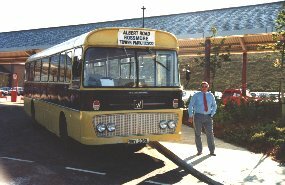 The Yellow Bus operation was the start of the (still continuing) financial support for the route from the Borough of Poole. Another operator comes along, this time Roadliner of Poole, who started an hourly service (financially supported by the Borough of Poole) on the extended 168 / 169 Rossmore routes, now with each journey serving both Alderney East and Bourne Estate as well as the traditional points of Trinidad Estate and Rossmore Road. 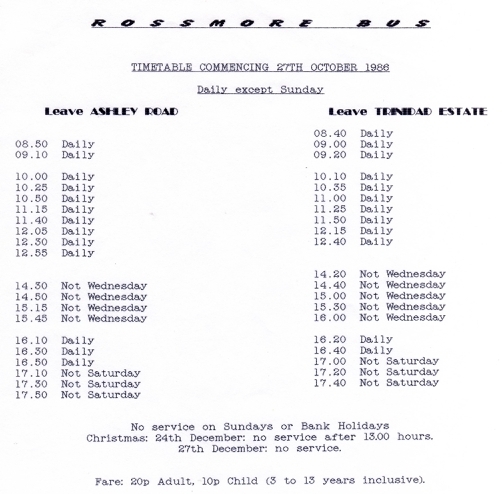 Reviving its popular name, this was promoted as the number 8 "Rossmore Flyer" as shown in their timetable leaflet. 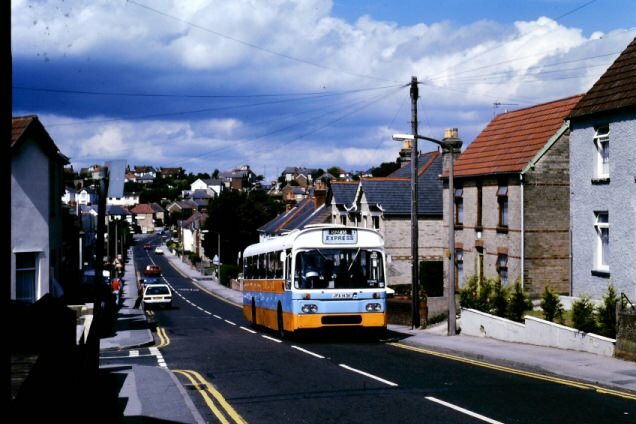 The service was also extended from Upper Parkstone to Alton Road, Sandecotes Road, Kings Avenue and Penn Hill Avenue in Lower Parkstone as the number 8 "Parkstone Flyer". Reviving in part the original 1930s concept proposed eighty odd years ago by Miss Foott, albeit by a somewhat different route! A picture of the new Rossmore Flyer on its first day of operation, with driver David at the wheel of a smartly liveried Optare Solo Y811 KRP (later reregistered Y555 ELF) at Penn Hill Corner, with Roadliner director Mark Self looking on, can be found here. From 1st March 2008 the route of the Rossmore Flyer was extended further northwards along Ringwood Road to include Alderney West housing estate as well as Alderney East. Following financial difficulties at Roadliner the operation of the route passed to Shamrock Buses from 29th August 2009. Change again, and from 1st April 2010 the operator became Dolphin Coaches of Wimborne owned by my former work colleague Terry Hann. The operations manager of Dolphin Coaches was coincidentally at that time Mark Self, who had been the director of Roadliner, the past operator bar one of the Rossmore route. A few days later, 7th April 2010, and the picture was taken at the official launch of the route by Dolphin Coaches. 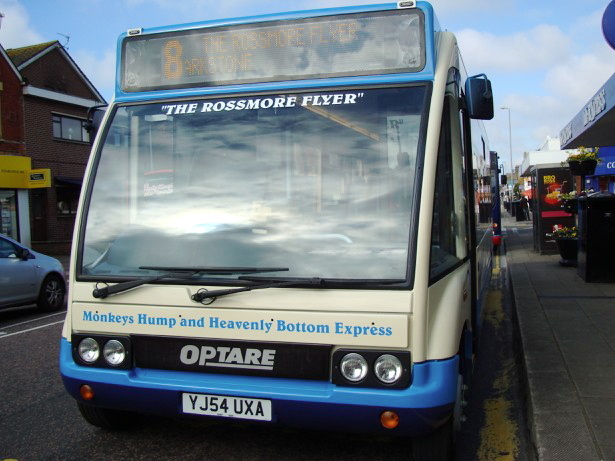 The Optare is now in livery and route branded both for 'The Rossmore Flyer' and 'Monkeys Hump and Heavenly Bottom Express'. Both of the names having long historical associations with running buses to Rossmore over the years. 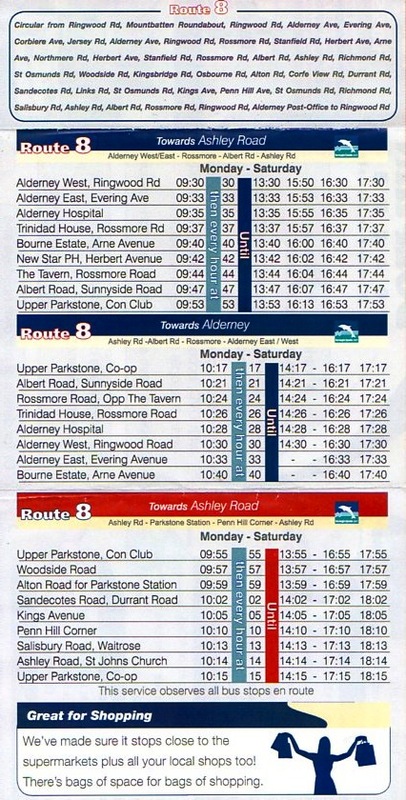 The new timetable leaflet from 1st April 2010. Note the bus with wings - truly now the Rossmore Flyer?